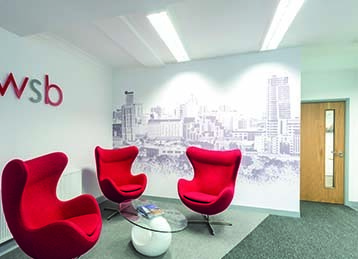 When refurbishing an office or starting a new fit out it is vital that you get the right office furniture, which includes lighting, and with our experience at Building Interiors we can ensure this is the case. 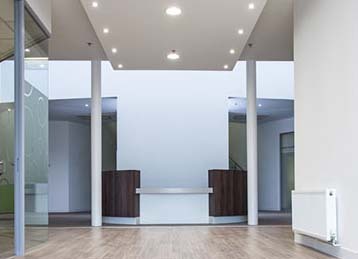 Our expert team will advise you on the best lighting solution for your offices, as getting a well-designed office without good lighting will often leave it looking dull and out dated no matter the quality of the design and colour scheme. There are a number of options when it comes to lighting with LED and LG7 being the 2 most popular. LED lights are far more cost effective in the long run which means your businesses electric bills will be reduced dramatically. A big advantage of LED lighting is the type of light it omits. Casting a more natural light into your office means a warmer working environment. 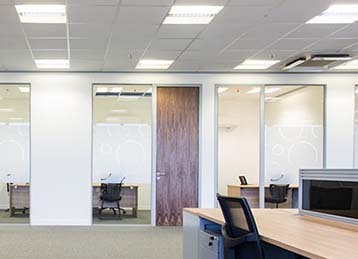 The most common office lighting at the moment is LG7 which stands for lighting guide 7 and refers to key standards regarding office lighting. LG7 is a lighting design guide and not a type of fitting, using mirrors to bend light onto walls creating well lit walls and great ceiling illuminance. It is ideal to meet the standards set in the lighting guide which states that work areas need to be at 500lux with the surrounding areas at a minimum of 300lux. This office lighting is still commonly chosen by a lot of our clients but isn’t our first recommendation due to LED lighting which does cost more up front but out easily outweighs the amount your business will save in the long run. The oldest form of lighting you will find in an office is Cat 2, this form of office lighting pre dates LG7 and should be replaced as soon as possible. With the changes to lighting standards in 2012, CAT 2 lighting is quickly becoming obsolete as it isn’t a cost effective solution when trying to meet the 500 lux working light recommendation. If you have CAT 2 lighting within your office you need to ensure that they are meeting the lighting guide recommendations. Upon request for office equipment you attended on site and listened to my requirements and provided me with several suitable options with competitive pricing. Once we had selected the solution the delivery and install was extremely prompt with no mess or fuss. I am very satisfied with the end product and the support and assistance especially in relation to maximising space by way of the office lay out. I would have no hesitation in recommending you to others who may require a similar service.